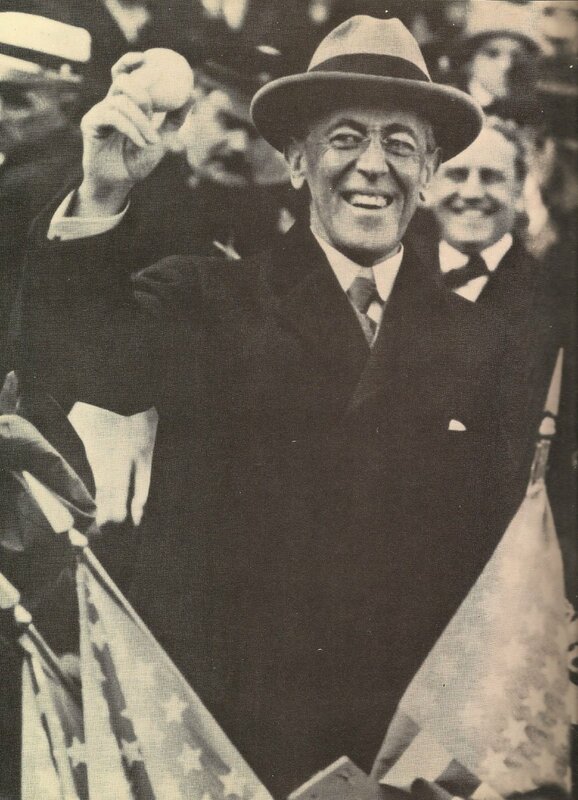 US President Wilson holding a baseball at a World Seriews match. He played a part in the fate of war incomparably more direct and personal than any other man. USA: Wilson speech ‘There will be no war … it would be a crime against civilisation for us to go in’. France: Nivelle visits and impresses King Albert from Belgium, tells him ‘We must gain our objectives in the first two days of the offensive’. Nivelle also forms a General Staff 4e bureau to handle all logistics at army level. Rumania: Mackensen takes Gurgueti and Romanul, piercing Braila bridgehead which Russians evacuate. Falkenhayn begins Battle of the Putna until January 8. Eastern Mediterranean: Russian pre-Dreadnought Peresviet sinks on U-boat (probably U-73) mine off Port Said; ship a Russo­-Japanese War prize bought back from Japan. London and Berlin agree to swap all internees over 45 years.